It’s not every day that an Elizabethan shipwreck is driven across middle England and dropped into a lake in Leicestershire, but that’s exactly what’s happening in the last week of May 2012. 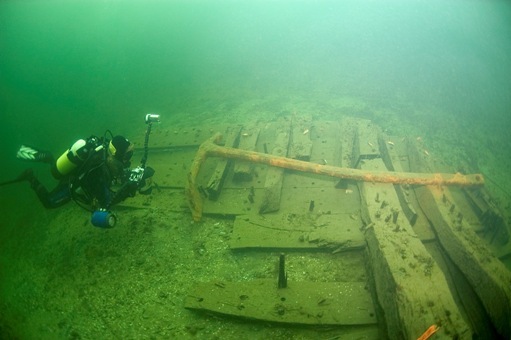 It will certainly be a day to remember at the Stoney Cove National Diving Centre, where the substantial remains of the 16th-century Gresham Ship will finally be laid to rest. Since sinking in the River Thames over 400 years ago, the ship has travelled many miles. It was rediscovered in 2003 by the Port of London Authority while they were clearing a navigation channel, and so they called in the archaeologists. A gun from the wreck bore the insignia of Sir Thomas Gresham (1500-1579) on the barrel, while tree ring analysis of the hull timbers suggested the ship had been built in or just after AD 1574. 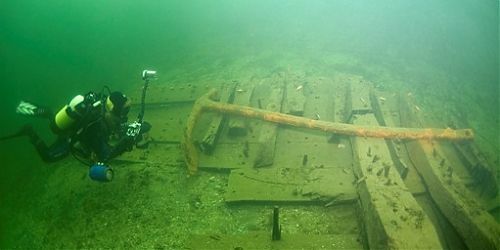 The team from Wessex Archaeology, led by Dr Jens Auer, recorded the astonishing find partially on the sea bed and then on dry land, once the five huge sections of the hull had been raised. In 2004 the remains were transported overland to Horsea Island Lake in Hampshire, were they were temporarily stored underwater for nearly eight years. Their final voyage begins at the end of May this year, when the sections and the anchor will be raised once again, carefully craned onto low-loaders, and driven to Leicestershire, a distance of some 160 miles. Once laid out in its new home in the flooded quarry at Stoney Cove, the shipwreck will be part of a museum display with a difference: this one is 6 metres underwater. The remains represent that most exciting period of Elizabethan seafaring, exploration and adventure, the age of Drake, Frobisher, Seymour and Hawkins. But it will be more than that, for it will also serve as a major focus for training the next generation of nautical archaeologists, as the Nautical Archaeology Society expands its pioneering educational role with the development of a unique “underwater classroom”. The largest section is over 8 meters in length and weighs some 8 tons, so it’s not going to be easy. Once we get the hull sections into the water at Stoney Cove, we’ll be using lifting airbags to help float them across the lake to get them into their new positions. I’ve hand-picked a team of 8 divers to work on this difficult task: they are all very experienced, so I’m sure that we can sink the pieces in the right place at the right time”. The finds recovered from the Thames Estuary have been studied as part of five-year research programme, funded by the Port of London Authority, and co-ordinated by archaeologists at University College London and the University of Southern Denmark. Part of the cargo from the armed merchantman included iron bars as well as lead and tin ingots, representing a prosaic but valuable consignment for this hard-working trader. Other finds include pieces of pottery, a silver spoon, some pewter and copper vessels, as well as leather shoes and part of a sailor’s boot, no doubt hurriedly shaken off as the owner desperately swam for his life as the ship went down. As for the cannons, they are currently stored by the Royal Armouries in their Museum at Fort Nelson in Hampshire. But all eyes will be on Leicestershire on the 1st June, when the hull timbers are finally lowered into the lake at Stoney Cove. The Gresham Ship is a national treasure: it was an armed Elizabethan merchantman, the type of vessel that fought against the Spanish Armada in 1588, and now it’s the focus of the first underwater museum of its type in the country.